According to Rush Limbaugh and other right-wing commentators, Dark Knight Rises attacks is a populist attack on corporate America and advocates the viewpoints of the Occupy Wall Street demonstrators and their offshoots in the West. Such commentators maintain that the movie promotes violent protest and social upheaval. They also claim that it condoned physical attacks on Wall Street and the wealthy , calls stock brokers 'thieves' and approved of property confiscation and eviction of the wealthy from their properties. The movie supposedly glories in scenes of economic collapse. In this neo-conservative perspective on TDKR, class warfare carried out by a jealous and vicious underclass was portrayed as justified and necessary. Such critics cite Selina Kyle justification for theft: "I take what I need from those who have more than enough." They also refer to her warning: "There's a storm coming, Mr. Wayne. You and your friends better batten down the hatches, because when it hits, you're all gonna wonder how you ever thought you could live so large and leave so little for the rest of us." "Maybe it’s an oversimplification to say that that’s the purest form of the ideology that was bequeathed from Richard Wagner to Nietzsche to Adolf Hitler, but not by much." For such critics, The Dark Knight Rises depicts Gotham's citizens as a bovine, unthinking mob, who deserve being beaten up by the city's police at the movie's climax. As in Weimar Germany, the wealthy lead lives of conspicuous consumption, greed abounds, unemployment is rife and political and financial corruption is everywhere. A Tale of Two Cities makes this identical point about pre-revolutionary France. These political and societal failures mean that the populace are easily lured into support for a strong leader - like Hitler - but the selfish ruling class of Gotham are detached from reality. The writing of Thomas Carlyle, Richard Wagner, Nietzsche and Hitler himself claim that only a 'hero' can overcome political, economic and social chaos. For some liberals, this is the explicitly anti-democratic message The Dark Knight Rises is advocating. But in fact Nolan's movie is Dickensian, not fascist or populist. Throughout Dickens' work, including A Tale of two Cities, his consistent theme is that all human institutions and societies are frail and flawed. Dickens constantly exposed such evils as child labor, financial and government corruption, slum housing and exploitation of the poor and vulnerable, especially children. But to the anger of many on the left his solution was not social or political revolution, or the overthrow of property. His attitude towards the revolutionaries combined sympathy with disapproval. Yes, they had suffered and were the victims of injustice and exploitation. But this did not justify their committing acts of violence and terror upon others. This is exactly the same attitude that Nolan adopts in TDKR. This is a continuation of Martin Luther King Jr's attitude on racial and social issues. Dickens insisted that we all must take responsibility for our actions and their consequences. The greatest obstacles to progress are the greed, laziness, selfishness and arrogance within us. Only by a change of heart and a willingness to reach out to help others can the evils of the world be overcome. Thus at the end of Two Cities Sydney Carton sacrifices himself to save another man and help the woman he loves. "It is a far, far better thing that I do, than I have ever done; it is a far, far better rest that I go to than I have ever known." Similarly at the end of TDKR Wayne/Batman appears to sacrifice himself so that Gotham can survive, and these words are read out at his graveside. Nolan also adopts another theme from Dickens' novel. Here an ordinary, flawed individual (Sydney Carton) steps up and assumes a role of civic responsibility for the greater good. He acts against great odds to protect the helpless and the innocent against evil. In TDKR the figure of Blake has this role. most explicitly in his mentoring and sheltering a group of orphans. 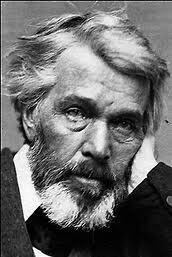 Thomas Carlyle, 19th century English historian and philosopher, whose book 'The French Revolution' influenced Dickens' 'Tale of Two Cities'. Caryle's theory of the importance of the hero in history also influenced the novelist. 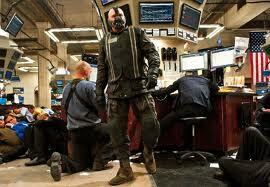 Bane tales over the Stock Exchange. Neo-conservatives claim the film justifies appropriation of wealth. 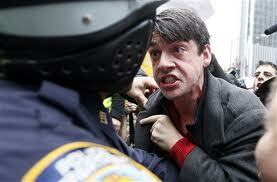 'Occupy Wall Street protestor. 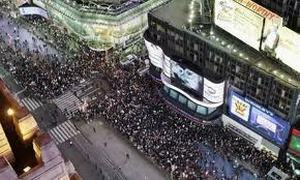 Some critics argue protestors in the movie are portrayed as mindless sheep; or a vicious rabble others claim they are portrayed as having legitimate grievances. Sydney Carton sacrifices and redeems himself in Ralph Thomas' 1958 movie of Dickens' novel. Blake - an example of the Dickensian figure who steps outside his normal role to protect the vulnerable. Two of the nineteenth century's greatest novelists produced masterpieces on the nature of revolution. Dickens wrote A Tale of Two Cities and Victor Hugo, wrote Les Misérables, an enormous novel which covers three revolutions, and the key scene of which is set during a failed insurrection. Since its successful transposition into an incredibly popular stage musical, Les Misérables has become known to people whose only previous use for Hugo's novel would have been to use it to use it as a brick. Both novels have been made into movies on several occasions, most recently Tom Hooper's version of the stage musical. Most of the several movie versions (and the musical) use one of the most dramatic scenes in Hugo's novel, the failed Paris insurrection of 1832, which depicts savage street fighting between rebels occupying makeshift barricades and the troops sent in to suppress them, and provides a cinematic context for comment on the nature of revolutions. 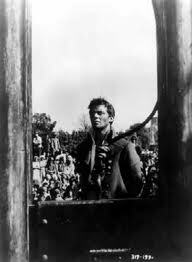 Were the Nolan brothers inspired by scene of revolt and resistance in movie versions of Les Misérables? Dark Knight Rises uses their features of armed protesters / revolutionaries supporting leader, use of barricades, and a brutal confrontation between two opposing sides on main city street.